As requested, here's a separate topic for an alternative version of OneBar, in which locked tabs are shown as favicon-only small-size tabs: the lock indicator and the page title are hidden. Width of navigation buttons slightly altered for more horizontal space. Gained another 2 (!) pixels vertically, hurray! 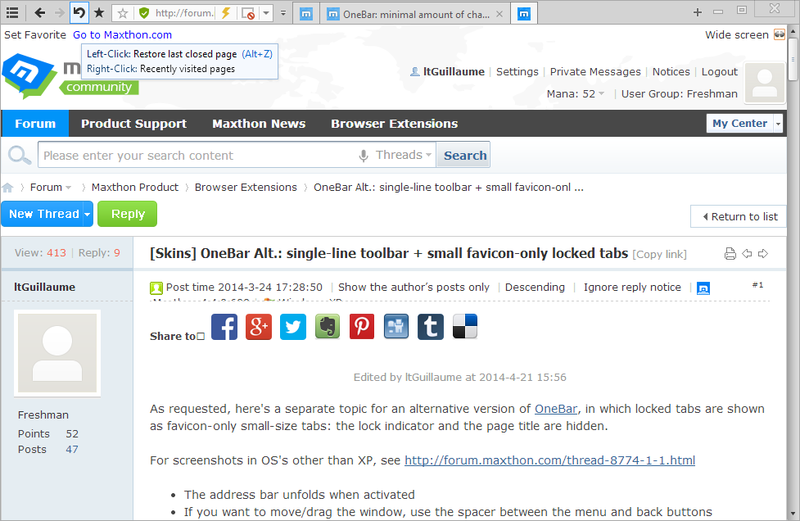 New Tab button fix of previous version caused Maxthon to lose the last session tab and all locked tabs upon restart. It's a real strange thing for such a small change. I removed the change, so you can use the skin safely again. For those who want to adjust the skin to their own preferences, the maximum tab width had to be hard-coded (to 232px), so the skin3.ini variable doesn't work anymore, change in skin.css. Tip: to save some horizontal space, you might want to edit Maxthon\Language\en.ini to make the Reader Mode button smaller. Change it into something likeReaderMode.Available=Reador you could even make it 'button-only' by putting only a space there (although the tooltip is gonna be blank then, too). Any tips how could I apply this feature to any skin? By any I mean actually IE10 skin. Tried to add code in skin.css file as tony's package does, but no result. Hard thing is that in his mxskin there are only two quite clear files, I cannot move this effect on my skin though. Would like to fix the New Tab button jumping to the right, any ideas? Even when I removed any CSS changes from the skin completely, they still won't show up. Does work in XP. Old versions of this skin have the exact same issue now. Any ideas? Is it still working for you? Maybe if I can make the tabs container (inner?) a flex-flow one and then use the order attribute for locked tabs. I tried quickly, but I failed. Any ideas? I have very strange skin behavior - buttons looks hidden, I can see its only when I moving cursor on. I update Maxthon to 4.4.0.3000 and last version of skin still make me the troubles - I lose my Last Session again, and tabs also doesn't work - I can't see any page except blank after skin install. You need to restart Maxthon after installing the skin. Maxthon developers are screwing around a bit with the UI, with SVG's and all. If you still had the problem with the disappearing buttons, you didn't have the latest version. Unfortunately you're probably right about losing your last session the first time. I'm very sorry, of course that was never the intention and I'm in the dark about why this happens. Has anyone seen this as a general non-skin related issue, or this happening with other skins? I do have MX4 latest version on Win-7, maybe problem in system differences? And lose my Last Session again? I made it twice, that's enogh for me. No, sorry, I woudn't try anymore until you try to make fixed version. It started when I redesigned the /main/tabbar/container.htm file so that the New Tab button stays where it belongs, next to the last tab. That's the only thing I know. But the thing is, that's not a big change at all: it just includes the More Tab list button and the New Tab button into the tab-container-inner div. That's it. I saw this behavior in 4.4.0.3000 as well... It's so strange, and I'm sorry that it caused you to lose your session. Since this skin only makes a few alterations to the default skin, I can't imagine that no other skin has the same problems. Can you help me find it so maybe we can find a solution? I reverted this little change, so now the skin is safe to use again. You won't lose your last session/locked tabs anymore when coming from another skin (version). I use the tabbar spacer to drive the new tab button where I wanted it in one of my skins. I recall a post here showing how to reorder the html to do it, but I can't find it or come up with the right sarch term to bring it up. There were several tutorials on making skins, but they seem to have disappearede ... didn't come up in searches including "tutorial" anyway. But I found that a search with just "ttutorial" revealed them just now. If I find the one that illustrates what to do, I'll put the link here. line to push the New Tab button to the right end of the tabbar; or leave it where it is, if you want New Yab button adjacent to the last tab in the tabbar. In my use I was pushing it to the right end. I didn't encounter any problems form doing that. I'm running with your skin at present. So far so good. Thanks for keeping it updated. Thank you, everything is fine now with this version (from 10 May). Thanks SL! Didn't see this message before somehow. However this does not apply to my skin: it seems that Maxthon "thinks" the New Tab button should be all the way to the right when a number of tabs are opened. However, the C++ code doesn't take into account that locked tabs now are significantly narrower than usual, so even though the total width of the tabs doesn't span the entire width of the tab container, it still puts the New Tab button all the way to the right (which is not what I want). Of course my interpretation might be wrong, but putting the the New Tab above the "bottom-wrapper" div did do the trick (it stuck to the right of the right-most tab, even when there are locked tabs). However it introduced the problem of having to restart Maxthon in order for the skin to be applied properly (otherwise several New Tab buttons would be shown and new tabs would NOT show, until a restart) and you'd lose all your locked tabs and last session tab on the first restart. Also I have small problem with last skin version from May 10 - only when too many tabs go to the list in the right side of tabbar: I try to use Ctrl+Right arrow to go next tab, but have only refreshing active tab. Its a very small bug so I can live with it just to notice you. Its a default shortcut to switch between tabs - from active tab to next tab right or left aside, and its work everythere, as I know. Maybe I'm wrong )) but its works for me all the time. And how to edit skins and their code? }Package the folder to a new .mxskin (not .mxaddon) file. For now (not for new updates), here's the .mxskin so you don't have to do the above just yet.